A fully restored 1970 Gottlieb Aquarius wedgehead pinball. 45 years old, beautiful condition, playing as new. A fully restored 1965 Gottlieb Hurdy Gurdy Add-a-ball pinball. Fifty years old, highly collectable, restored to mint and playing like it did the day it left the Gottlieb factory. A fully restored 1973 Gottlieb Pro Football pinball. 41 years old, very nice four flipper game. Beautiful playfield. Plays like new. A restored 1962 Gottlieb Cover Girl. Made before the Beatles had a hit record. Roy Parker pin up artwork, simply as good as it gets. A very desirable Gottleb wedge head. GAMES IN THE RESTORATION QUEUE. All these games will be totally overhauled electro mechanically and completely restored cosmetically. Any new or good used parts required will be fitted during the work. They will have either cleaned and polished, re plated or reproduction metal work as required. When finished, they will look fantastic and play as they did when new. Reserve a game and I will restore it to an agreed specification. Bally On Beam, Gottlieb Bank A Ball and Williams Ding Dong recently added. A 1957 Bally 'Sun Valley' bingo pinball machine in superb condition, having been the subject of a recent three month total restoration. It is now looking fantastic and playing perfectly. This is an extremely rare, nearly sixty years old, Bally magic squares and lines bingo game. Vintage pinball games are fast becoming the hot collectable items of the twenty first century. They are getting harder to find and rising in price, especially the really nice ones. A good vintage juke box from the same era will cost £10,000 plus. How long will it be before these classic electro mechanical pinball games have similar price tags? Nothing like them will ever be made again, and very limited numbers survive. Having one in your home adds a new dimension to entertainment. Playing one is a great alternative to watching ever poorer quality television, especially on a dark cold evening when there is little else to do. The fact that they may prove very wise investments is a bonus. Restorable games are very hard to find here in the UK. Most offered for sale are worn out, cosmetically awful and playing badly, if at all. Any title worth restoring may take a very long time to find. I spend unknown hours searching for and looking at games that may be worth buying. They are easier to source in the US, but the cost of bringing one here is around £1,000-00 including taxes, on top of the cost of the game. And they still need work. And a 240 to 110 volt transformer, as US games do not have a UK multi tap 240 volt unit. I spend many hours restoring my games so they play as new. Then I spend many more hours restoring them cosmetically. I make sure every lamp lights as it should. I make sure every stepper, relay, and motor works as it should. The same with the score units, and I clean and polish the drums. I clean and gap all the contacts. I check all the switch stack screws are tight. I make sure all the solder joints are good. I clean the cabinet internally and externally. I overhaul the flippers, slingshots and pop bumpers. I fit new parts as required. I strip, clean and polish the playfield. Then I rebuild the game so it looks stunning and plays superbly. When all the work is completed, I play test and refine the game, to ensure every feature works properly and it plays perfectly. That is what you receive when you buy one of my games. A fully restored, fully working, and beautiful example of the title you choose. The result of my knowledge, experience, skill, and something I absolutely enjoy doing. All my games can be set on free play or fitted with a coin mech'. All the games come with a schematic wiring diagram, essential for future maintenance, and a new box of lamps. All games are fitted with a new rubber ring set and ball. I can deliver for 45p / mile or collection is fine. If you would like to have more images or information about any game, please contact me for details. I will always consider taking a game in part exchange. Click the link to see how to purchase a game. I have more machines arriving regularly. If you are looking for a particular game title, ask me, I may be able to find one for you. A 1972 Bally 'Fireball' EM pinball machine. This game is in very nice original condition. It is playing perfecly. Extremely hard to find as it is one of the most collectable electro mechanical pinball games of all time. It is a riot of fun, very fast, and looks fantastic. 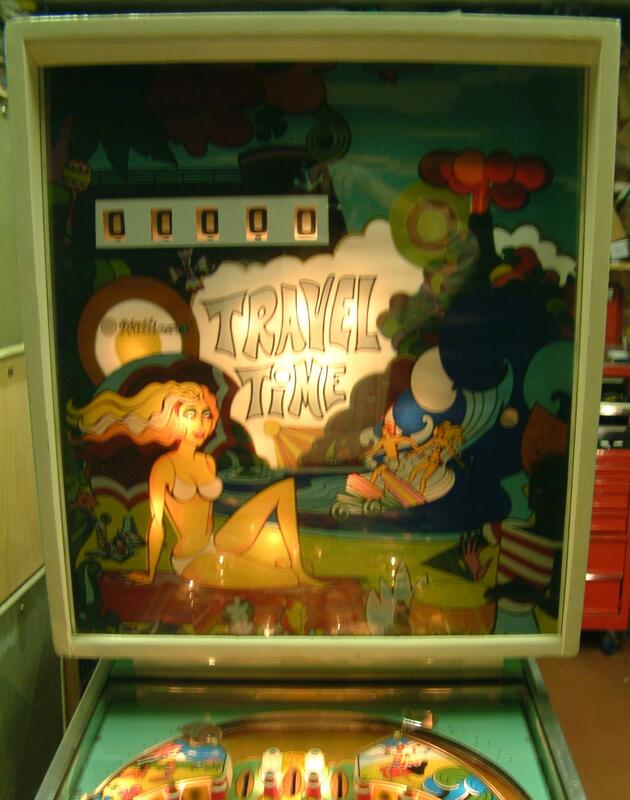 A 1973 Williams / Segasa 'Travel Time EM pinball game. An unusual design where the number of balls is only limited by time. The game is in nice condition and fully working. A 1952 Bally Palm Beach bingo pinball machine. A very early bingo in exceptional condition for its age. Completely overhauled electro mechanically and working perfectly. It is a great game to play.